How Does the Index Work? The Sun is a powerful source of all kinds of radiation. Most of the harmful radiation coming from the Sun such as X-rays, UV rays and others are absorbed by the ozone layer in the atmosphere. However, some radiation seeps through and can cause skin and organ damage to living plants and animals including humans. Ultraviolet radiation is of most concern to humans. So what is the UV Index? The National Weather Service and the EPA have devised an index that measures the strength of the ultraviolet radiation coming from the Sun. The diagram to the left shows the severity of the ultraviolet radiation on a scale of 1 to 11+. Having 2 or less listed in the forecast would mean minimal risk, 3 to 5 is moderate risk, 6 to 8 is high risk, 8 to 10 is very high risk and 11 and above is an extreme risk of exposure to UV rays. These forecasts are made daily since the amount of ultraviolet radiation entering the Earth varies on a day to day basis. The amount of radiation also depends on the time of day, the season, the altitude and the latitude at which you are at. The greatest risk of exposure is at high noon or midday when the sun is directly overhead and can cause the most damage. So exactly what factors determine the UV Index and how is it calculated? The National Weather Service uses computer models to calculate the UV Index which relate the ground-level strength of the the ultraviolet radiation to elevation of the ground, forecasted ozone concentration and forecasted cloud amounts. First, satellites gather the total amount of ozone levels over the entire planet. This data is used to forecast the ozone level for the following day. Using the data of these levels along with the incident angle of the sunlight at each point, a computer model calculates the strength of the UV radiation at ground level. The UV radiation strength is calculated for several wavelengths, for UV-B as well as UV-A. Next, the human sensitivity to UV radiation is taken into account. 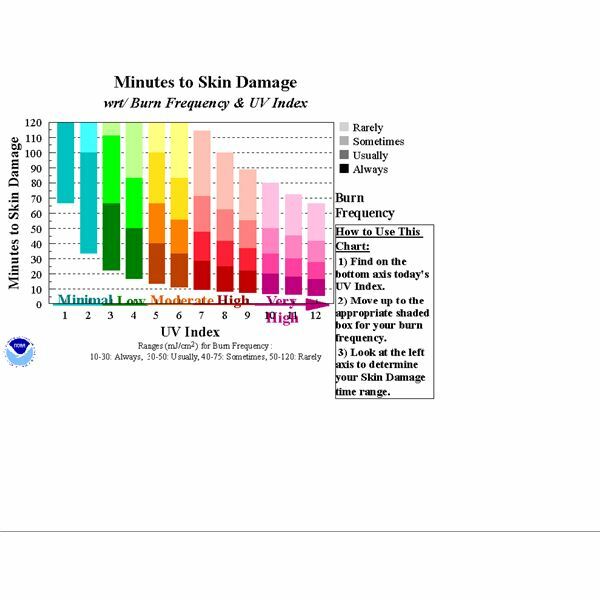 Since shorter wavelengths cause more skin damage, the UV strength is adjusted at every wavelength using the McKinlay-Diffey Erythema action spectrum. Following this, the strength of the UV radiation in the range of 290-400 nanometers is summed up which gives a value representing the total effect of the radiation on the skin. The elevation and cloud clover is then taken into account. As one moves up in elevation, there is a 6% increase in UV intensity per kilometer above sea level. With clouds, the factor of cloud cover is important because clouds absorb UV radiation coming from the Sun. For example, on days with clear skies, 100% of the radiation is transmitted as opposed to overcast skies when only 31% of the radiation is transmitted. The final step in the calculation is to divide the acquired number from all the calculations by 25 which gives a whole number ranging from 1 to the mid-teens. Overexposure to the sun will result in increased amounts of UV radiation penetrating the body. This can have serious consequences ranging from sunburns to rashes to cataracts to even skin cancer. It is for this reason that the EPA advises to avoid outdoor activities on days with high risks of exposure to UV radiation. Be extra cautious near water, snow and sand. Try to avoid sun tanning and also tanning beds. Whenever possible, try to find sheltered areas that provide shade including trees. Do not expose yourself for long periods of time to the sun. Try and limit the time you are outdoors. Avoid the mid-day sun if possible. Wear sunglasses, hats and full-length clothing. Protect you skin from any kind of exposure. Always check the UV Index before heading out. Knowing the risk of exposure will help you plan your day in advance. Get the recommended levels of Vitamin D. Take Vitamin D pills to sustain the levels in your body, since Vitamin D can only be generated in the body by exposure to the sun. Apply generous amounts of sunscreen. Make sure that the Sun Protection Factor(SPF) is at least 15 or more. Now that you know how the UV Index works you can make it a habit to check it on a daily basis for the safety and well-being of you and your loved ones. Additionally, taking the precautions listed above will also help you remain protected in drastic weather conditions.